Home / Uncategorized / iNinja returns from the dead at Atlantis! iNinja returns from the dead at Atlantis! Our first event at Atlantis casino in Reno was a huge success. 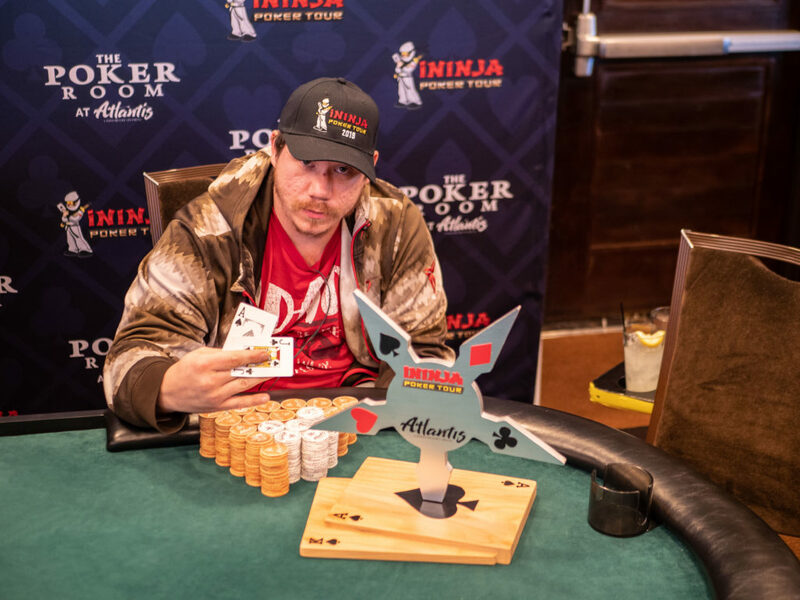 With total prize pools of nearly $300,000, and a guarantee smashed every day, there can be no doubt that iNinja is here to stay. The day by day breakdown of the events is below, and you can read a lighthearted look at the events from our perspective over at CardPlayer Lifestyle. We arrived in town a little early to prepare, but the first official happening was not until the 6th, the day before the series kicked off. 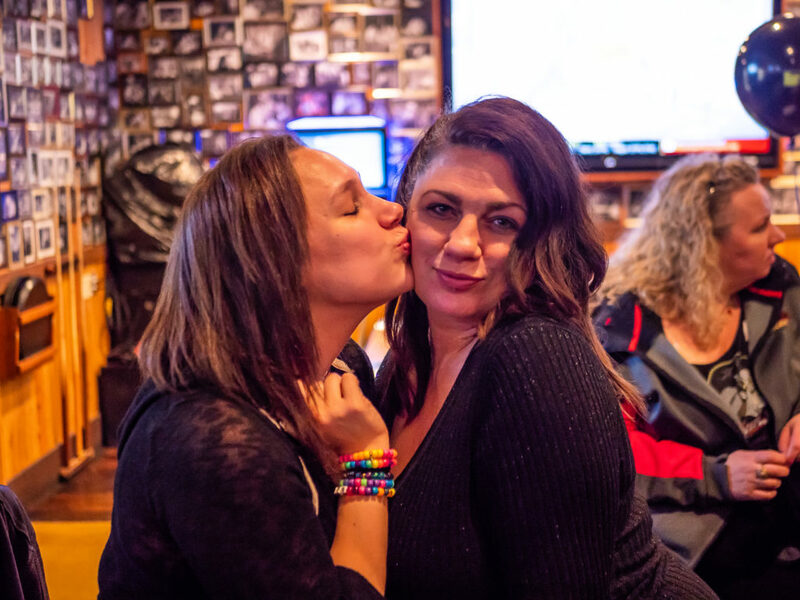 We met up with some local players, dealers, and staff, at a wonderful little bar and restaurant called the Lucky Beaver. Located just across the street from the Atlantis, the Beaver has fantastic food, cocktails, and staff. We went back multiple times over the course of the event. Of course they were ninja balloons. Of course. Our friend Shyla showed up with a friend in tow. Her pal Trina, who was dealing the event, was very interested in the tour. She has been a twitch streamer in the past and loves the industry. The Lucky Beaver would indeed be lucky for us as our meetup with Trina made us a new friend and a new team member! There were balloons, party favors, drinks, and food, until the wee hours of the morning. Some in celebration of our first big event since the relaunch and some in anticipation of a long road ahead. When you are about to start working fourteen hour days for almost two weeks, the beer flows freely. The big day! In working with the staff at Atlantis, we learned that Reno players love bounty tournaments. Their bounty events have always done well in this slot, so we kicked off the series with the Warm Up Bounty, a $150+50 event that drew a nice field of 79 entries. Not bad for our first event on a Thursday in evening and it surpassed the guarantee easily. 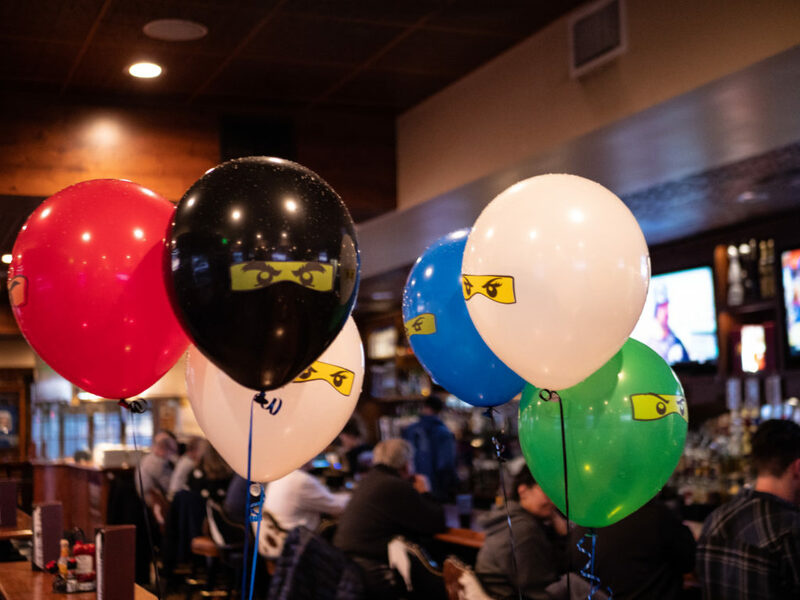 Players had a great time, and iNinja themed party favors were again dished out. We were impressed with the staff at Atlantis and the dealers that came in from out of town. Things were looking good. The Warm Up Bounty was ultimately chopped, with local pro Ivan Zarate getting the lion’s share of the prize pool and the other players each walking with a nice profit for the night on top of whatever bounties the had collected. Ivan would cash in a number of our other events and feature in a fun prop bet story later on. The $70 mega-satellite to the $40k Guarantee event also drew on a nice field, giving away eleven seats and some cash. The first two flights of our $280 buy-in event had the room buzzing. $40,000 was an ambitious guarantee for such a small buy-in, but we were confident that we could pull it off. With some help from the marketing department at Atlantis, we were on track after the first two flights and another satellite. We loved seeing the overflow area and hallways filled with players. The old iNinja used to pack rooms for similar events and it was great to see that the old magic was still working. This was our earliest start of the series, at least for the staff. The local news channel KRNV Reno was in the poker room at 5 am to begin airing live spots with us on the morning news. We aren’t morning people (especially Fox) but we had some coffee and made it to the card room before five. 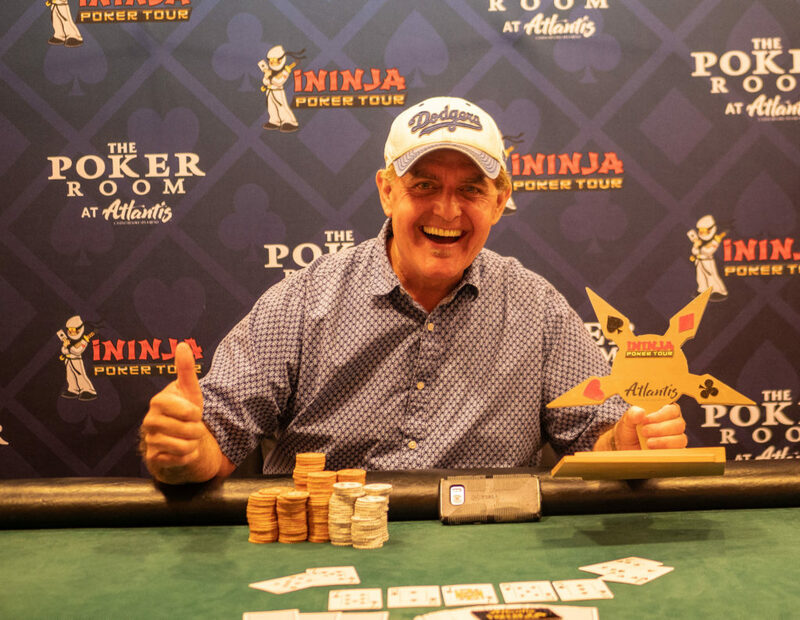 Two more flights for the $40k event brought the total field up to 199 players today. As with all of our two day events, everyone who makes day two is in the money, so the players coming back on Sunday were all pleased to be up for the weekend and fighting for that $11,000 prize up top. A $200 Omaha/8 event also drew a nice crowd. Players at Atlantis love mixed games. They have a big bet mixed game on Monday nights that includes at least 25 games, some of which we had never heard of. Have you ever played Tahoe Pitch and Roll? How about Double Board Drawmaha with a bloody river? No? Neither had we, but after one night we were hooked! 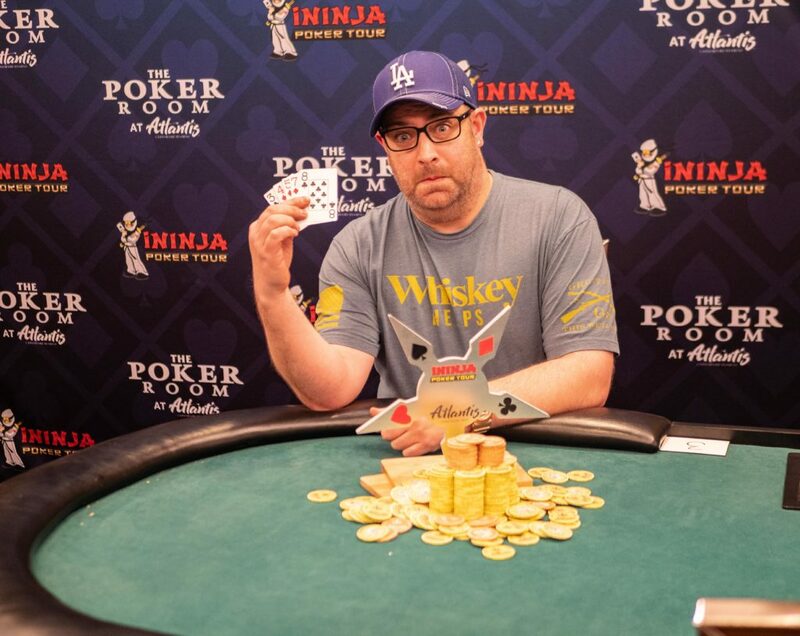 Monte Gilly won the Omaha/8 event after a long heads up battle. Someone was going to win a big pile of cash today as we wrapped the $40k guarantee event. 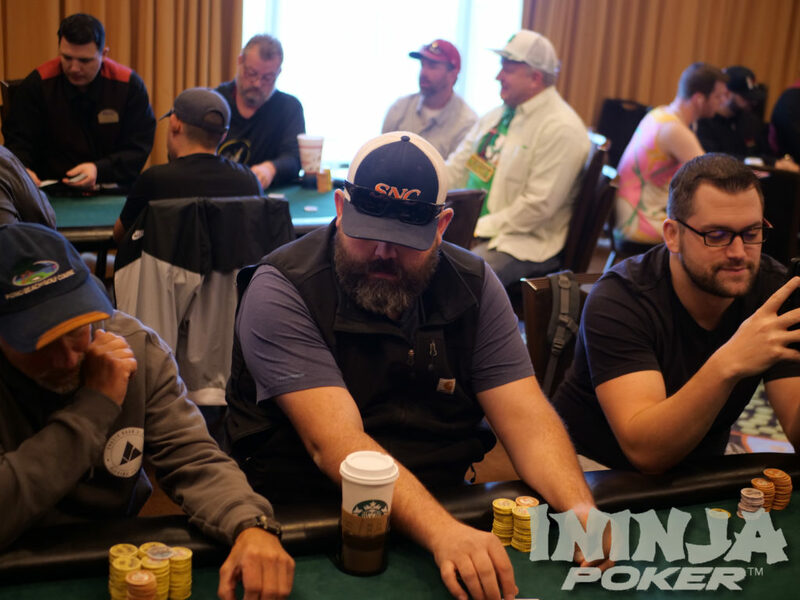 26 player returned for day two, and our first bust out of the day was Ivan Zarate, who’s name continued to come up throughout the series. At the end of a long day, Kyle Wright and his stone poker face took down the event and the trophy. Kyle played well from start to finish and we expect to see him at many more final tables in the future. We also had our first resurrection event of the series. The resurrection events were created to celebrate the return of the tour from the dead (rumors of our demise were greatly exaggerated). To this end, we created an event where each players has the option to buy a resurrection chip when they buy in to the event. For $20, the player gets a special chip that allows them to come back to life with 20 big blinds when they bust out, no matter when that might be. A resurrection chip might be worth 1,000 during the first level of an event, but over a million at the final table, so preserving that chip is the key to success in these events. The resurrection concept was a great conversation starter, with players talking strategy and watching as the chips were used, seeing them gain value every time the level went up. In the end our victor was our very own pink ninja, Molly Mossey. 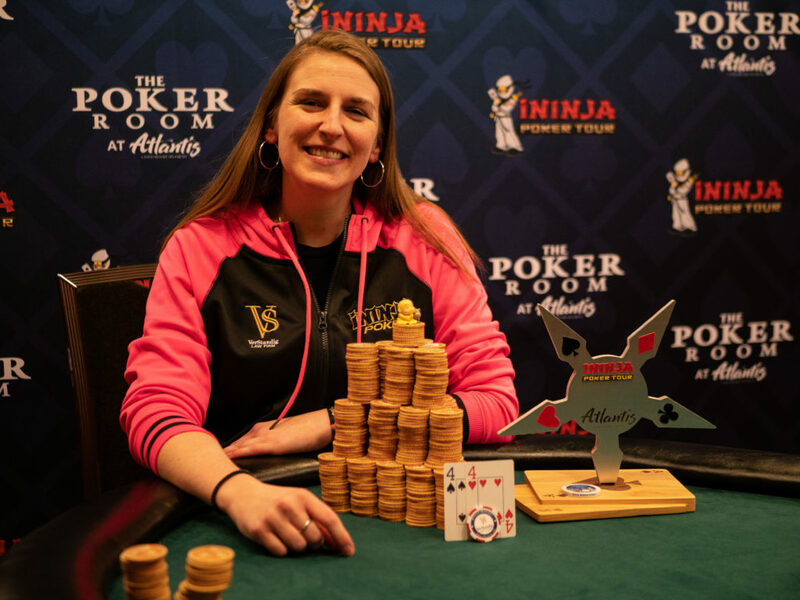 You may know Molly from her career as a poker reporter where she write about the biggest events and best players in the world, or her appearance at the final table of the ladies event at the WSoP last year. She has been a big supporter of the tour since it’s inception and we were ecstatic to see her win her first ever trophy in our trademark event. The Pink Ninja wins the first Resurrection event of the series! The final event for the day was the Black Chip Bounty, a favorite among Reno locals. The vast majority of the prize pool in this event was in the bounties, so knockouts were the name of the game. 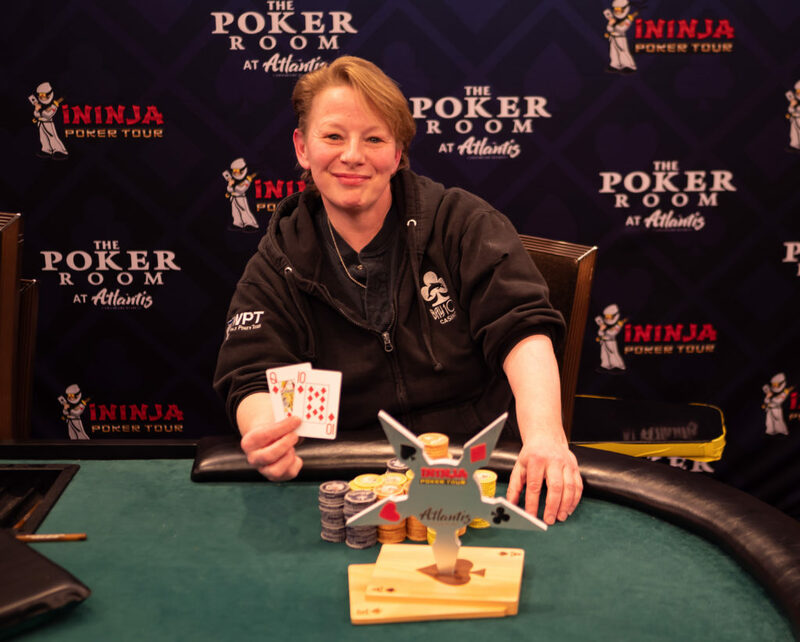 Local Christine Pichard won the event after collecting a nice stack of bounties. The big event for the day was an event we co-ran with the Western Senior Poker Series. The WSPS does a great job with these things, and even brought a busload from Stones Gambling Hall to play the event. The owners were a ton of fun and we hope to work with them again very soon. You know you are working hard if you draw 157 entries on a Monday morning! The second event of the day was a $180 no-limit Holdem event that brought in a nice field as well. 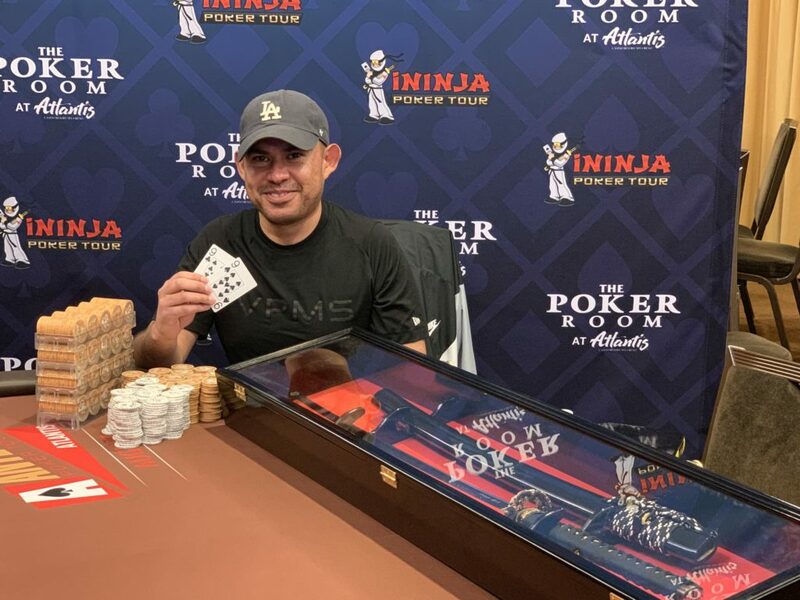 The event was was won by Jaime Navarro-Rosale, who works for the card room and runs the crazy mixed game I mentioned earlier. A rousing game of Svitten 1-2-3 anyone? Congrats Jaime! The second event of the day was a $160 eight-game mixed event. 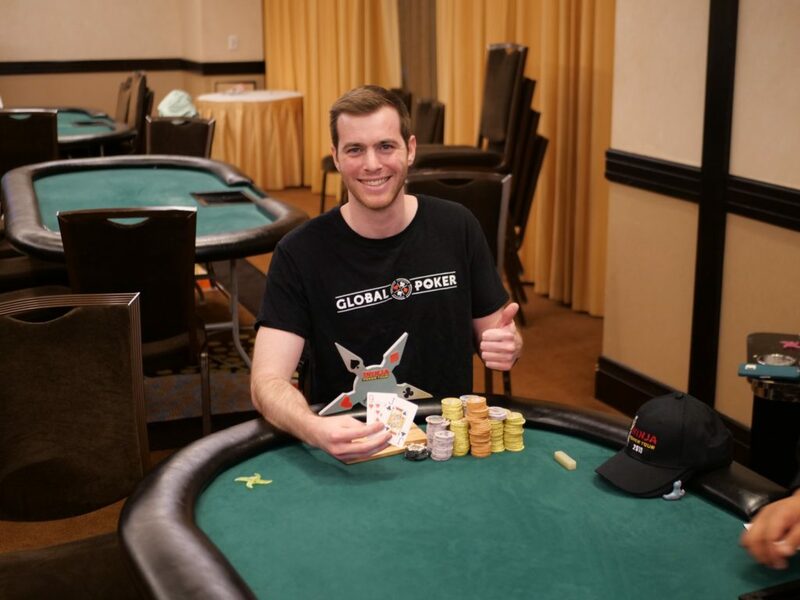 While we generally don’t play our own events, the staff at the Atlantis thought some of the players would enjoy mixing it up with a mixed game bracelet winner, so Fox agreed to play for charity, letting his twitter followers choose the charity from the four favorites the Atlantis regularly works with. Northern Nevada Make-A-Wish was the winner by a thin margin. Brian loves mixed-games as well, so he jumped in too, playing for The Veterans Guest House, a wonderful charity that was doing a fundraiser down the hall. They put us on the radio to talk about our event, so the least we could do was try to win them some money. David Badolato looks baffled by the concept of a winner’s photo, but he wasn’t baffled by the mixed games event where he dominated the field. A six-max bounty event, something you won’t see at most casinos, was the big draw today. With a $260 buy-in and a nice field, 10 players were paid in addition to all the bounties they collected. David Veillette was the eventual winner in a slug fest. The rest of the day was filled with satellites to the main event, with players filling up the hallways in the overflow area to play in two mega satellites. After a long week, it was finally time to get started with the main event. Our main event will change according to different areas and venues, but in Reno we decided on a $100k guarantee with a $500 buy-in and we went for it. Flight 1A looked pretty good with 53 players, pretty solid for an early flight. From there we sailed on to beat the guarantee easily, thanks in part to the excellent marketing efforts from Atlantis with billboards all over town, commercials on tv as far off as Sacramento, and signage everywhere. While we did a ton of social media and guerilla marketing, the Atlantis crushed things from their end too. In the end the prize pool was nearly $140,000. 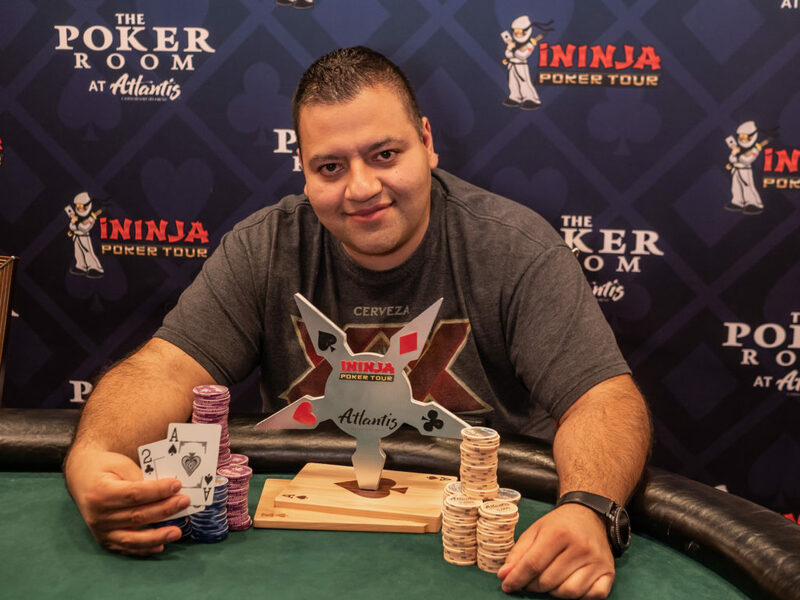 Victor Paredes took down first place for $28,000 and a beautiful custom made katana from Japan with the iNinja logo etched into the blade. 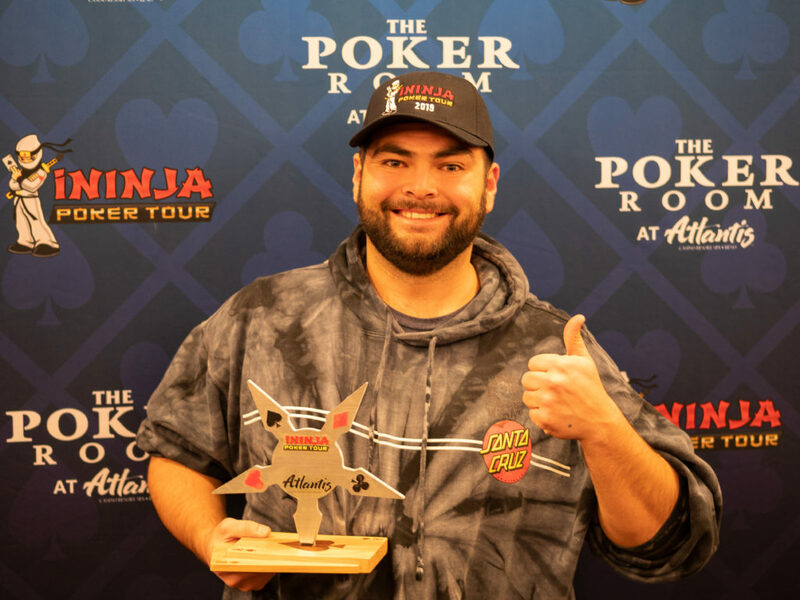 Victor Paredes is all smiles after winning $28,000 in our main event at Atlantis! One of the most fun events of the series was the Mystery Swag Bounty. 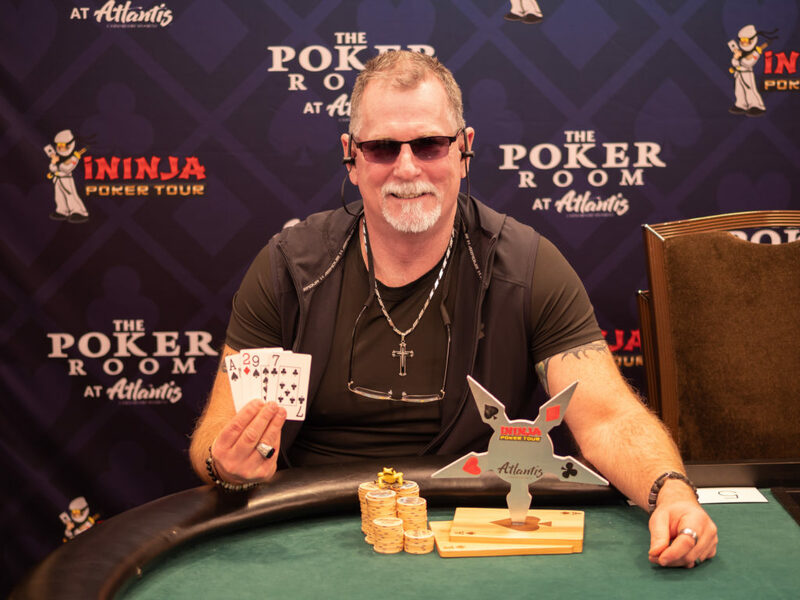 every player had a bounty on them, including free play from Atlantis, hats, shirts and other swag from Atlantis and iNinja, signed copies of Fox’s book, and even a pair of Blue Shark Optics poker glasses. Lewis Mitchell took down the win and a stack of fun bounties. Interesting story about Mitchell Lewis and his pal Ivan Zarate. Not only did they win the first and last events of our series, but they had the most interesting prop bet of the series. Check out the video below to see how Mitchell ended up in a dress and cowboy boots during the main event. Lewis Mitchell and Ivan Zarate discuss the prop bet that landed Mitchell in a dress for the main event. We wrapped up the week with a few drinks with the crew and headed home on Monday, already missing the Atlantis, but we are planning to back next year for an even bigger and better event and more good times! Thanks so much to everyone at Atlantis for hosting us and running such a great event, we really had a great time.